Shrubby perennial plants; branches angular. Leaves broadly ovate, acuminate, usually wrinkled, more or less pubescent. Pedicels slender, usually 2 or more together. Calyx embracing the base of the fruit, usually cup shape. Corolla white or greenish white. Fruit red, ovoid, obtuse or oblong, acuminate. Throughout warmer parts of India; cultivated; often found as an escape. · Capsicum is used for various problems with digestion including upset stomach, intestinal gas, stomach pain, diarrhea, and cramps. · It is also used for conditions of the heart and blood vessels including poor circulation, excessive blood clotting, high cholesterol, and preventing heart disease. · Other uses include relief of toothache, seasickness, alcoholism, malaria, and fever. It is also used to help people who have difficulty swallowing. · Some people apply capsicum to the skin for pain caused by shingles, osteoarthritis, rheumatoid arthritis, and fibromyalgia. · It is also used topically for nerve pain (neuropathy) associated with diabetes and HIV, other types of nerve pain (neuralgia), and back pain. · Capsicum is also used on the skin to relieve muscle spasms, as a gargle for laryngitis, and to discourage thumb-sucking or nail-biting. 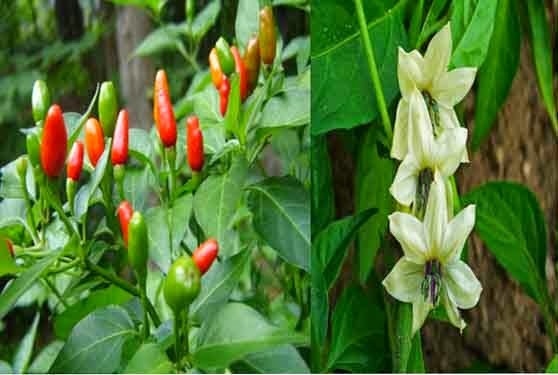 · Some people put capsicum inside the nose to treat hay fever, migraineheadache, cluster headache, and sinus infections (sinusitis). Used as stomachic, carminative, stimulant, antiseptic, styptic and antidirrhoeal; useful to treat atonic dyspepsia; as digestive stimulant in jaundice. Taken internally to check lumbago and rheumatism. Capsicum extract is possibly unsafe when used in the nose. No serious side effects have been reported, but application in the nose can be very painful. Nasal application can cause burning pain, sneezing, watery eyes, and runny nose. These side effects tend to decrease and go away after 5 or more days of repeated use. Capsicum is likely safe when applied to the skin during pregnancy. But not enough is known about its safety when taken by mouth. Stay on the safe side and don’t use capsicum if you are pregnant. Applying capsicum to the skin of children under two years of age is possibly unsafe. Not enough is known about the safety of giving capsicum to children by mouth. Don’t do it. Don’t use capsicum on damaged or broken skin. Capsicum might increase bleeding during and after surgery. Stop using capsicum at least 2 weeks before a scheduled surgery. Grows on wide range of soils including sandy loam and red loam in tropical climate best in fertile with manure and sunlight. The content is strictly copyrighted to the Saikat Manna and may not be reproduced without permission.